There is a point in Homer's "The Odyssey" where Odysseus is washed ashore from a shipwreck.A young woman comes to his aid, rescuing him from his end. She was Nausicaa, lover of nature, and eventually serving as a mother of his rebirth. In Hayao Miyazaki's first masterpiece "Nausicaa of the Valley of the Wind" he heralds a protagonist of similar inspiration, whose own odyssey and heroism would take on Homeric proportions. The Valley's princess, Nausicaa, is a free spirit and genuine "renaissance man." Puzzled by the jungle's nature, she frequents its depths for resources and answers. Aside from mastering flight, she's also a ferocious warrior when need be. But what truly defines her is her uncanny rapport and devotion to all living things. The film's story takes place in a dystopian timeline where human civilization appears to be in its last throes. A vast toxic jungle envelops the land, teeming with monstrous insects, hostile to anything that disturbs the expanse. A few kingdoms remain, at war with the jungle and each other. One remaining beacon is the Valley of The Wind, a peaceful and prosperous feudal community, seemingly protected from the jungle by its bordering forest and strong winds. One day she is visited by Lord Yupa, a noted Valley resident revered for his wisdom and unparalleled swordsmanship. He has returned from his search for a prophesied savior only to return with grim news. That same evening a massive airship crashes near the valley, attacked by an insect swarm. Having come from the neighboring jungle, it brings spores which threaten the Valley's forest, as well as an uneasy cargo. The Valley soon learns that its ominous load is a prize sought by warring kingdoms, one of which lays siege to the Valley. This leads to various adventures, escapes, revelations, and locales of staggering creativity. Ranging from underground caverns, to heart of the toxic Jungle, and even to the very stratosphere. 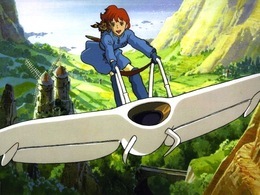 The film is considered to be the first of Miyazaki's works to showcase his strong environmental inclinations. In every film since he has made his case for man to grow closer to nature as a return to the olden days. He does so with positive reinforcement, hardly ever resorting to demonizing, moralizing, or sermonizing. Here, the toxic jungle isn't so much an inhospitable realm as it is a fearsome marvel of nature. It's huge arthropod denizens never come off as oozing grotesques, but wondrous (though scary) creatures. The film's largest creations, the ohmus, are wholly original, and are almost proof that the eyes are the window to the soul. Miyazaki's refusal to narrow down conflict to two or even three sides is refreshing, and quite admirable considering its target audience. The film's story does concern good versus evil, but they aren't manifested in simplistic ways. Each populace has its own motivations. Each conflict has its reason. Wars exist among man and against nature. Several stakes exist. Even death is hardly out of bounds. For much of the film, there is no one problem/solution. But despite this moral complexity for an animated film, it all fits Miyazaki's big picture, and in the end we see it. It takes a deep wisdom and understanding of youth to be able to carry out this vision. To know that children will grasp and want to grasp his story and ideas. 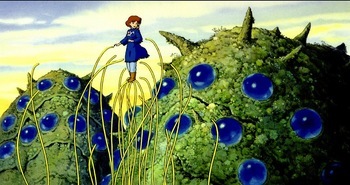 Miyazaki accomplishes this not only by his storytelling techniques, but also through his visual artistry. Like the very best of Japanese animation, there is a warmth and softness to his illustrations (thanks to his pristine watercolor motifs) that make it almost effortless for viewers to accept and acclimatize to what unfolds on the screen. It allows for his characters and narrative to "breathe" (and breathe deeply), with moments of contemplation and authentic feeling taking hold. Compare this to his contemporaries who have to rely on cutesy gimmicks, frantic pacing, or glitzy style to draw in audience interest. But its "what" he illustrates that captures our hearts as well as our minds. Much of anime in the past 20 years has concentrated on a utopian future, filled with technological wizardry and innovation, which is abundant in Japanese culture. But Miyazaki tends to look back instead of looking forward, inward instead of outward, looking at treasures of futures past that might have been. Like most of his films, his timeline here isn't technological, but pastoral, with people relying more on each other and the Earth. He favors gorgeous green panoramas usually near blue bodies of water. He is in love with flight with his heroes soaring through the sky, representing our dreams of breaking through our limitations. We sense his hope in women more than men, believing them to be the key to humanity's progress as opposed to man's history of violence. These creeds and themes are held dearly and instinctively by the young and hopeful, and its Miyazaki's ability to convey these naturalistic ideas through his visual imagination, which makes him unique. And his imagination. My God is it breathtaking. Only Pixar has been able to rival Miyazaki's creative energies in forming entirely new sights, sounds, and stories with each subsequent film. 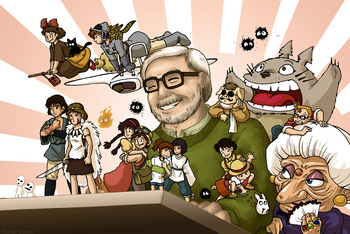 But Pixar is a collection of talent (all of whom pretty much worship him), while Miyazaki is a singular force. While even the greatest of directors have to rely on cast and crew to carry out their visions, Miyazaki pretty much IS the film. He might be the closest thing to the idea of an "auteur" which filmdom has. Yes I effuse praise for Hayao Miyazaki, but to write about his films can only lead to discussing the marvel that is the man. No other animator has produced such an admired body of work in the past 30 years, nor has influenced so much of its workings. And in the world of animation "Nausicaa of the Valley of the Wind" is one of its brightest stars, giving birth to Studio Ghibli and its priceless body of work. It is the seminal Miyazaki film, breathing wonder, tenderness, and life into worlds where we'd all like to live in. • Michael Mirasol tweets at @flipcritic. • Final drawing by Kazu Kibuishi, who tweets as @boltcity.